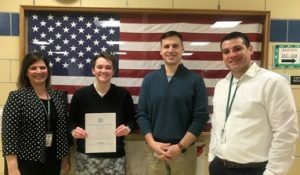 FULTON – G. Ray Bodley High School senior Jenna Ruzekowicz has been selected as a National Honor Society Scholarship semifinalist. GRB Principal Donna Parkhurst, left, proudly stands alongside GRB senior Jenna Ruzekowicz, who was recently named an NHS scholarship semifinalist. Nathan Fasulo, NHS advisor, and Joseph Nofal, guidance counselor, stand in a show of support and pride. The prestigious honor comes with a $3,200 scholarship toward her pursuit of higher education. Chosen from more than 11,000 applicants, Ruzekowicz’s academic and community service accomplishments have been reflective of her hard work and commitment to each of the four precepts of the NHS. One of 575 semifinalists nationwide, Ruzekowicz has been recognized by the National Association of Secondary School Principals for her leadership, scholarship, service and character. She currently serves as the Joseph Campolieta Chapter of the NHS at GRB. GRB Principal Donna Parkhurst said Ruzekowicz is most deserving of the national recognition. Ruzekowicz has been highly engaged in both her learning and social activities throughout her time at G. Ray Bodley High School. She has been involved in numerous clubs and organizations, such as the Yearbook Club and Student Senate, as well as swimming and lacrosse. Additionally, Ruzekowicz has organized a school clothing drive, participated in Hopeprint and has worked this year to coordinate an event in the Fulton community for Feeding Children Everywhere. Fulton City School District administrators, teachers and supporters are proud to see Ruzekowicz’s growth. This fall, she will attend Stanford University for environmental studies and policy. Since 1946, more than $15 million in scholarships has been awarded to outstanding NHS senior members to support college access and student success. Ruzekowicz, proudly, is a local success.